This review wasn’t supposed to happen. I’m up in the Albian wastes in Alberta for my day job and the review that was scheduled to run this week fell through. John O’Neill came to my rescue with a short ebook just published by Samhain Publishing. 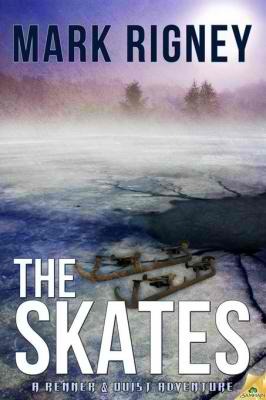 The book is called The Skates and it is part of the series of Renner and Quist adventures written by Mark Rigney. I’ll be honest up front in stating I had not heard of the publisher, author, or series before this time, although I’ve since realized Mr. Rigney is a fellow Black Gate blogger with several short stories to his credit already published by the online magazine. My main relief was that John allowed me to get a review done without missing a week and the ebook was short enough to read through in barely an hour. Then I read the damn thing and my perception changed instantly. I curse simply because I envy Rigney for his talents. This wasn’t a fun, enjoyable read so much as it was a story I instantly loved. I’m sure the folks at Samhain Publishing are nice people, but why hasn’t Rigney’s fiction been noticed by editors at major publishing houses? Yes, it is that good. I’m fairly familiar with the New Pulp world and Rigney can write circles around most of us as he seamlessly blurs the lines between genres and switches voice from one first person narrator to the other. Renner and Quist are a double act. I hesitate to say “in the grand tradition” simply because I don’t believe they have literary forbears. I’ve encountered double acts this entertaining before, but they’ve been supporting characters only. Rigney’s odd couple (in more ways than one) comprises a stuffy Unitarian minister and a rather crude, sometimes boorish, ex-linebacker. Together they solve occult mysteries. Rigney’s world revolves around his characters’ faith (or their lack thereof) in the supernatural and preternatural. Reading his prose put me in mind of Douglas Adams with the less overt Pythonesque influences or, perhaps more appropriately, early Vonnegut without the biting venom. That isn’t to suggest that Rigney doesn’t aim squarely at his targets, but rather that he is less concerned with puncturing them than he is with provoking thought while entertaining his reader. Make no mistake, this book is grand entertainment as Rigney deftly moves between satire and horror while sending Renner and Quist on a screwball quest involving a pair of Victorian ice skates (think The Red Shoes and you’ll have some notion of where this is going), a ghostly hound of a surprisingly docile disposition, and the finest séance scene I have ever encountered. The author switches between genres as effortlessly as Renner and Quist pass between centuries as they seek to restore peace to souls in torment. Simply put, I love this book and want to read the rest of the series. More than that, I want an editor at Del Rey or HarperCollins to wake up and recognize this man’s talent. Renner and Quist deserve a wider audience and one man’s enthusiastic review will not do. I have been converted by Rigney’s talent and like any zealous follower, I’m eager to share my newfound faith with others. 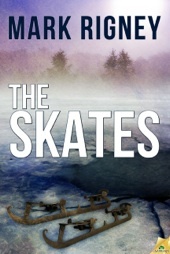 Add The Skates to your Kindle queue today and come along for the fun. This one really should be earning hype from all quarters. This story sounds like Exactly My Kind of Thing. Thank you for calling it to my attention!